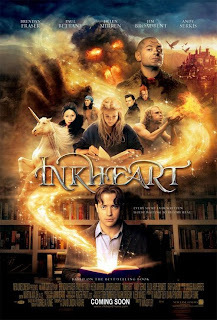 Inkheart is a 2008 fantasy film, directed by Iain Softley and stars Brendan Fraser, Eliza Bennett, Paul Bettany, Helen Mirren, Andy Serkis andJim Broadbent. It is based on the novel with the same name by Cornelia Funke. The film was first slated for release on March 19, 2008, but had been pushed back to December 12, 2008 in the UK and January 23, 2009 in the US, partially because of New Line's marketing worries in connection with the now-concluded 2007–2008 Writers Guild of America strike.